I was shy as a child. A chubby girl hiding in large shirt and baggy jeans. With my natural wavy hair, dad would always cut it hair short, they call it 'siete'. I always wanted to wear nice hair clips and ribbon but it never happened. Those were my insecurities when I was a kid. Today, I love the skin I'm in. In 2006, I went to Hong Kong for the Nurse Licensure Exam so I could work and apply for an immigrant visa in the US. During my trip, I went around and did some window shopping. At Watsons, I found this huge bottles of Dove shampoo and Dove cream bath for less than HK$50. Since then, if I can afford I would only pickup Dove each time I would go shopping. 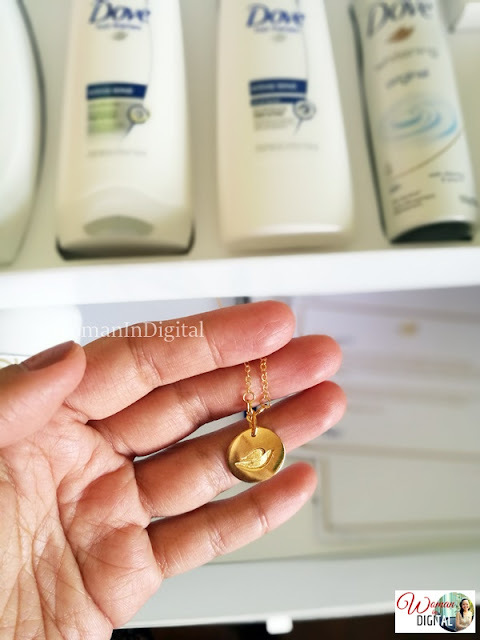 With Dove's 1/4 moisturizer, no doubt it really helps soothes dry skin. I also recommended it to my husband with problematic, acne-prone skin because it's mild and gentle to the skin. It's the only bar soap I can use for face. 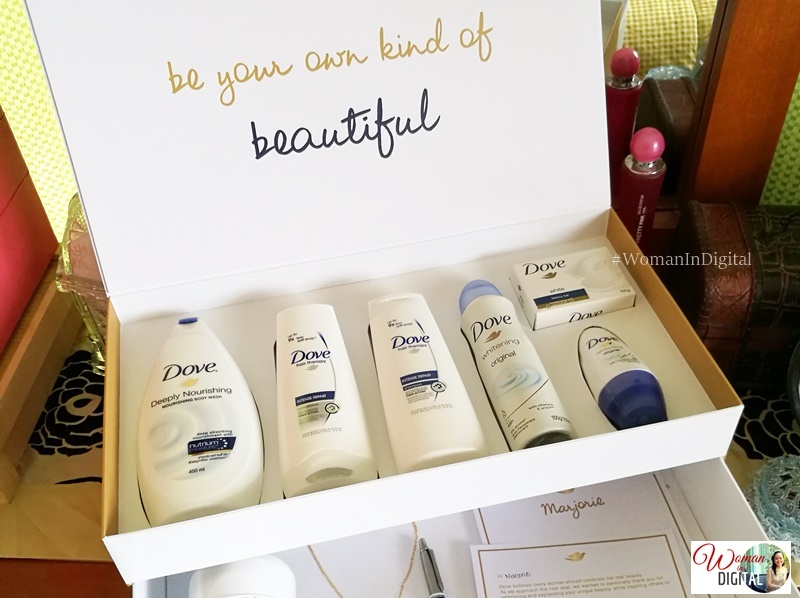 Thank you Dove Philippines for this lovely Real Beauty Starter Kit. It comes with all Dove products - deeply nourishing body wash, shampoo and conditioner, whitening deo spray and roll-on, Dove beauty bar. 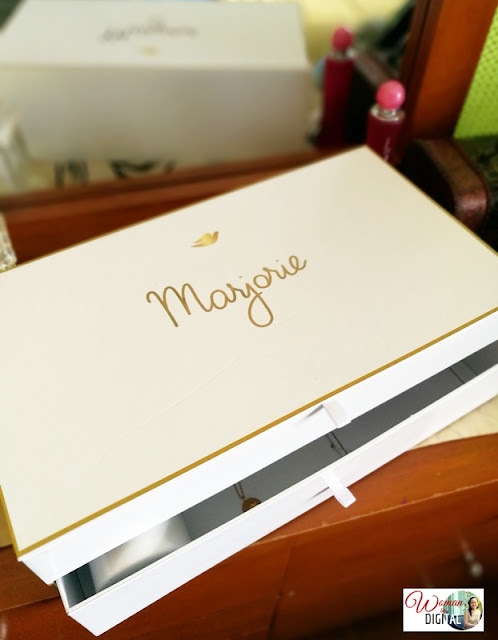 The lower drawer has a personalized tumbler, notepad with my name, Parker pen with my name and a gold necklace with Dove logo. You can always find a bottle of Dove shampoo and conditioner in our bathroom. Even if there's a new product in the market, I always go back to my first love, Dove! It was five years ago the last time I had my hair straightened. Since I'm on a journey to healthy living, I promised to use only products that are not harmful to my body. Dove has influenced us, women through every heartwarming tvc and printed advertisements. It speaks about women's real beauty. Sometimes insecurities over appearance keeps us from being our best selves. I learned to love the skin I'm in. Today, I love my natural wavy hair. I enjoy hair coloring and blow-drying because there's Dove that strengthen every strand of my hair. I also use Dove hair vitamins infused with Vitamin E, botanicals and mineral oil that nourishes the skin. Beauty is a state of mind. May this year be the start of a journey to discovering the real beauty within you. When you're down, cheer up and show the world how beautiful you are. We are all unique women. Start discovering what makes you happy and what sets you apart. Be your own kind of beautiful. Real Beauty, for me is the beauty inside and out. I feel most beautiful because I'm alive.